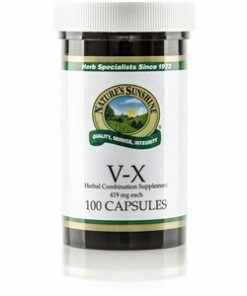 Nature’s Sunshine V-X blends herbs that support the female glandular and reproductive systems. Squaw vine whole plant, chickweed aerial parts, goldenseal root and rhizome, marshmallow root, mullein leaves, plantain leaves, slippery elm bark, and yellow dock root work together in V-X to cleanse the female reproductive system and to maintain the health of female reproductive organs. Instructions: Take three capsules with a meal twice daily.